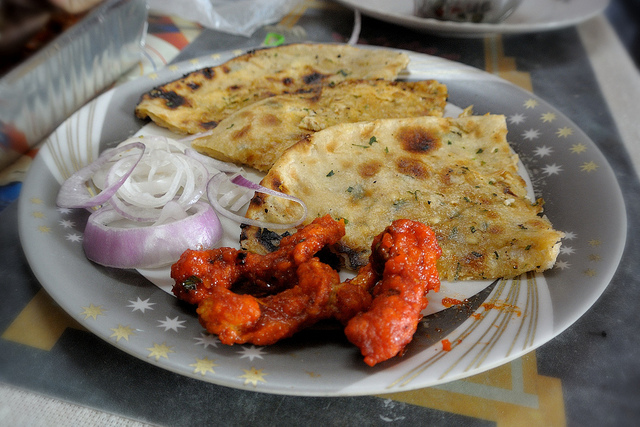 Exploring the state of Punjab, you’ll find a town of true food lovers in Ludhiana. The local cuisine here is simple, sizable and hearty, with no frills to distract from the exceptionally good taste. Ludhiana’s tandoori is renowned as one of the most popular cooking styles in the world: here’s our guide to the best places to try this delicious cuisine. Indian Summer serves a range of North Indian, Thai, Continental and Asian dishes. We’d highly recommend the mutton biryani, the prawn tikka masala, and the Thai curry. The atmosphere is decidedly kid-friendly too, making this a perfect pit stop on a family vacation. Located on the first floor of the Hyatt Regency, Kitchen at 95 serves the finest gourmet breakfast, lunch, and dinner in Ludhiana. Their menu spans Asian, Middle Eastern, Italian and Western cuisines, so there’s something to suit every appetite. The buffets and Sunday brunches are the best in the city, evidenced by the big swell of customers at weekends. Their produce is fresh and locally sourced, as they value growth and partnerships within the community. After you’ve ordered, you can watch chefs prepare these quality ingredients right in front of you at one of four live cooking stations. The Pizza King serves the best pizza in town, offering a superior local alternative to the big fast food chains. Their generous, gooey cheese and high-quality toppings are sure to leave you satisfied. Go for the pepperoni king or the Italian sausage if you eat meat, or a cheesy plain slice if not. They also serve sandwiches, pasta, and bruschetta, and all of their items are affordably priced. What started as a humble food cart has now grown into a fully-fledged restaurant. Rajan South Indian Dosa is still a small operation with limited seating, so grab a plate of their fresh dosas or crisp uttapams with yummy chutneys (try the red and the white), and take it outside to the casual seating out front. This is a great little spot to enjoy real South Indian food at a reasonable cost. R.E.D. lives up to its name, an acronym for “Rare Eastern Dining”: here you’ll find authentic cuisine from China, Japan, Thailand, Singapore, and other Southeast Asian nations underrepresented in Ludhiana’s restaurant scene. Headed by a top chef from Shanghai, R.E.D. serves exquisite fine dining a class apart from the requisite Chinese menu items you’ll find in Indian restaurants around town. Be sure to sample their delicious teppanyaki and sushi selections. If you’re craving something meaty, we highly recommend the lamb dumpling or the roast duck. This is where you’ll find the most succulent and delicious chicken dinner in town. The restaurant has a limited eating space and minimal decor but has a variety of chicken and mutton menu items to choose from. We’d personally recommend the rarha chicken, chilly chicken, tandoori chicken, and butter chicken with naan. Spice Cube is one those rare vegetarian restaurants that’s grown and flourished in a town of hearty meat-lovers. This is partly owing to the restaurant’s warm ambiance, which includes a delightful little waterfall and outdoor seating for sunny days. If you’re craving greens and some great meatless Chinese or Mughlai, Spice Cube is the place to be. Big N Meats is one of the most famous indie fast food joints in Ludhiana. Here you’ll meet a super sweet, smiling owner who will make sure your meal is a treat, no matter how big or small your order. This restaurant is ideal for meat lovers: tuck into their seekh kebabs, double sausage chicken hamburger, and barbecue chicken. You can even purchase frozen meats here to take home and cook later. Panorama is an excellent option for fine dining in Ludhiana, with an a la carte menu serving a variety of international delicacies at all meal times. The brightly lit, glossy white interiors and corridors lined with fragrant flowers create a fresh, Spring-like atmosphere. For a sweet treat try one of the cakes or cookies served in their coffee lounge. Kulcha Chole is a traditional Punjabi dish of spicy chickpeas, and Kulcha Land is the best place to taste it. While the seating here may be a bit restricted, dishes like the paneer kulcha and Amritsari kulcha more than compensate for any struggle for space. This is one of the best dhabas (roadside restaurants) in town, and one of the best spots for travelers to try traditional Punjabi food.